It’s hard for me to get a balanced and healthy breakfast in me. It’s a priority now. 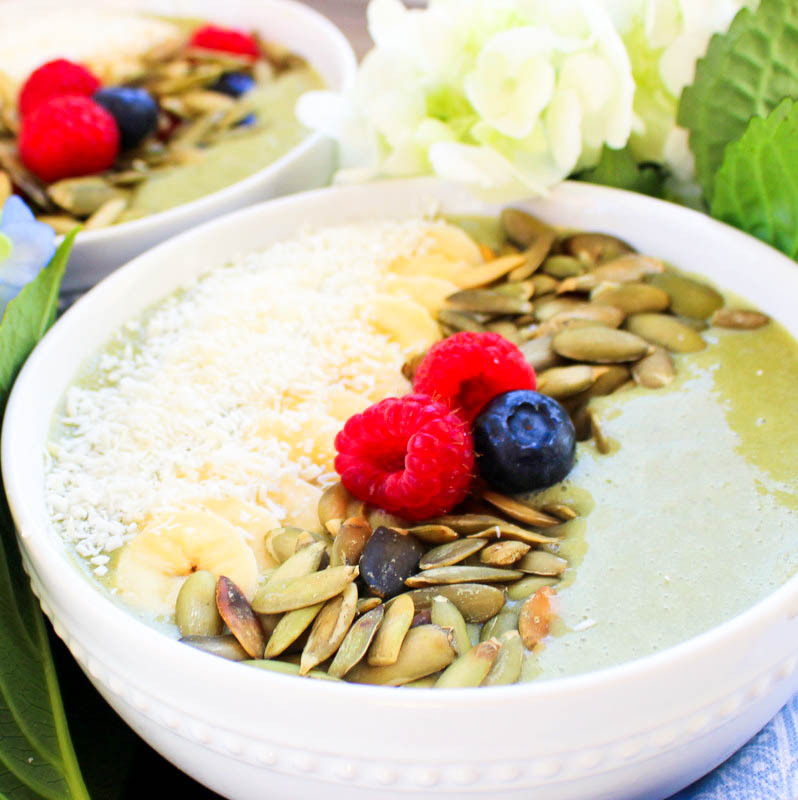 I’ve never heard of a smoothie bowl – how interesting! I like smoothies, but I find that sipping my meal isn’t as satisfying as eating it. And I like the idea of adding your own toppings – yum! I love sunwarrior products, I bake with them often and they are usually in my overnight oats!! so good in overnight oats!! I had my first smoothie bowl a few weeks ago and I am hooked! They are so delicious. This one looks amazing, I’ll definitely be trying this recipe! I agree, they are so delicious!!! I’m in love with green smoothies – but haven’t tried them in a bowl. I know that it’s important to actually CHEW something to get your digestive process started – so I love the idea of the toppings too! I’ll be trying this definitely! I love Smoothie bowls! SunWarrior is one of my favorite protein powders as well. Just blends so well and tastes awesome. Beautiful pics! Wow what a delicious look bowl that is! It’s so vibrant looks like I can just reach through my computer screen and grab it lol. This is a truly a great reinvention of that traditional smoothie and I really like the health benefits too. Thanks for sharing! Thanks Nikki! 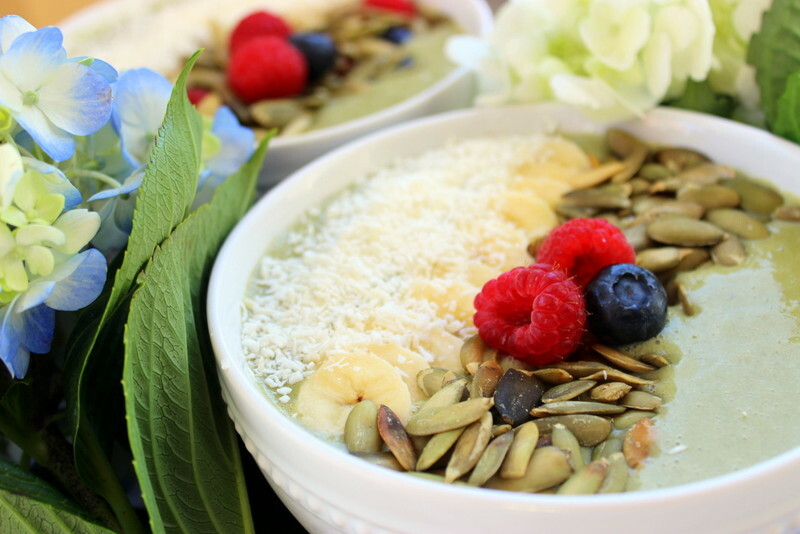 I need to make some more of these to share with you all, LOVE SMOOTHIE BOWLS! I have made many smoothies, but never thought about making a smoothie bowl. Great idea! One of my favorite smoothies is to blend bananas, pears with juice, vanilla yogurt and baby spinach. You can’t even taste the spinach, but get a lot of nutritional value. I haven’t tried smoothies but the way it was presented makes me want to try. Nowadays, it is better to eat healthy to avoid problems. It is so nice to make our own food and being healthy at that. This makes us in control of what we eat and add toppings to make our food enticing. so true TonyE!! thanks for stopping by! Hi, there, I really love smoothie’s! !, either fruit, in greens, in a bowl and etc…I was then first introduced to this kind by one of my foreign British Employers. I am an Asian, typically we don’t practice this kind of lifestyle before. But when I first tried and made it with a fresh Orange fruit, and with some ice and put it on a smoothie maker, wow!, this is really good! !Then on I loved experimenting and eating with this kind of foods. It brings joy and creativity in the table because of its natural colors, its fresh orchard scent and the taste of being “One in Nature”. And I believe from the saying”what you Eat is what You Are”. We love smoothies over here too, the kids demand them! heehee such a great way to get kids and adults to experiment with different fruit combinations! This looks delicious. I’ve recently been experimenting with 3-day smoothie detoxes and have found my energy has gone up, along with my mental capacity, and general well-being! I can’t wait to try this recipe, I will be swapping the Sunwarrior brand for one of my choice, but I love the recipe! We usually have this smoothie in a bowl everyday especially during summer’s or whenever the day is really that hot here in Asian country. Preparing any smoothie recipe would not give so much headaches or stress. Plus the fact, that its really easy, fast, enjoying, healthy and nutritious. Though, sometimes, we take some alternatives since some the ingredients is hard to find here in Asia. So, I would say, you can just mix it up, toss it whatever combinations you would like. And I’m sure your family and friends would definitely loved it!. I like how this is written and the Healthy options for breakfast. I am always eating a healthy balanced breakfast. Sometimes it may be hard when you don’t have the ingredients so you have to turn to something else, but I always tend to have bananas and oatmeal around. This looks absolutely delicious! Everyone in my family has a sweet tooth, so recipes like these are total winners with us. Can’t wait to try it out. It looks quite eye-catching and yummy. Though am from different side of the world who doesn’t used to consume those ingredients, this is something practical that I might try as an intermezzo of my Asian breakfast. I will try different combination, based on most available and affordable materials here. Thank you for bringing up this idea! It is always easier to tempt kids, or probably everyone else, into eating things that look good. I guess visuals do play a great role in increasing their appetite for healthy food. Awesome recipe! Thanks for sharing! This is the first smoothie bowl I have seen. Super neat. Gonna try it! What a fantastic idea! My whole family loves this bowl.